Where are our butterflies? There can’t be many of these around now, surely? Well, if you have a shed, outhouse or garage, these could be a warm winter home for a butterfly. 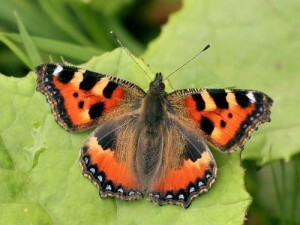 Species like peacocks and small tortoiseshells hibernate as adults and survive our cold winters. Plus with warmer winters, red admirals are also making it through. When there’s enough heat in the sun to warm the fragile, and often tattered wings of these hardy souls, you may find them floating around your garden. Seven species have already been recorded this year, according to our friends at Butterfly Conservation. But it’s not just the adults. Marsh Fritillary caterpillars hibernate over the winter inside a thick silk web, deep within a dense grass tussock, where they can even survive temporary flooding. The small black caterpillars emerge from hibernation in March and bask communally in the spring sunshine. Ballachuan Nature Reserve on Seil is a good place to see them.